At TNW, I work in a newsroom with reporters located in several different parts of the world. So it’s not always easy to figure out if a particular colleague is having their first cup of coffee in the morning, or if another has already clocked out for the day. There’s also daylight savings time to add to this confusion. If you’re in the same boat, I’ve got some handy tools that can help you keep track of the time across the globe. 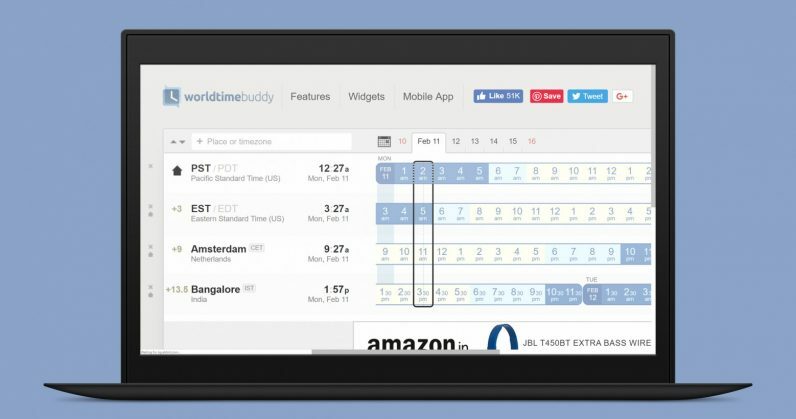 Up first is World Time Buddy, which you’ll want to bookmark right away. It lets you view timezones in a horizontal view, and you can add up to four locations to your screen at once for free (adding more will cost you $2.99 monthly for 20 locations. Plus, it shows weekends, warns you when daylight savings time is a week away, and you add meetings to your Google Calendar when you sign in with an account. If you’re a MacOS user, there.pm provides a useful status bar app to track the time right on your desktop. To make things easier for you to parse, you can add your friends or remote offices with their places and display pictures. The company says it’ll soon release a Windows 10 app and Slack integration, so you can import your whole team in one go. On mobile, both Android and iOS offer a default clock app with the ability to add multiple time zones and places to help you track the time easily. Go to the clock app. Tap on the plus icon on the top left to add other locations. Tap on Edit if you want to remove or rearrange locations. Tap on the globe icon to add other locations. Long press on an icon to change its order or remove it.